No one ever enjoys watching their team lose. As Cardinals fans, we’ve had the good fortune to watch great games from our team throughout 2013, with 97 wins in the regular season and nine wins in October. Fantastic, each game in its own way. Every single victory. 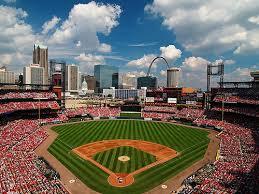 Yet not every game was as bright and beautiful as this picture of a sun-drenched Busch Stadium. There also were the 65 regular season losses, made all the more painful when they came in bunches — three in a row from time to time, the brutal seven-game streak in late July. And now the Cards have seven October losses following last night’s Game Five defeat to the Red Sox by the score of 3-1. It’s the second time this month they’ve lost two in a row. But this latest loss feels so much worse, that much harder to take than losing Games Two and Three of the NLDS to the Pirates. Which makes sense — the stage is bigger in the World Series, more people are watching and paying attention as the teams still playing now stand at only two. And the bigger the stage, the deeper into October we get, the more magnified everything is. Which makes the losses even tougher — especially losses in the World Series, and back-to-back losses at Busch Stadium where the Cardinals have had so much success this season. To lose the final home game of the year … ugh. That’s not how any of us wanted it to play out, obviously. And it wasn’t like it was an awful game — no, not at all. Adam Wainwright wasn’t terrible, not with 10 strikeouts total and five straight in the first and second innings. But those Ks came after back-to-back doubles by Dustin Pedroia and David Ortiz that put the Sox up 1-0 in the top of the first. Then the final K was leading off the seventh, and was followed by a single, walk, run-scoring ground-rule double and run-scoring single that ended with David Ross fortunately being thrown out at the plate. Three runs, eight hits and the one walk to go along with those 10 strikeouts. As I said, not terrible. But not terrific. And Jon Lester was terrific — again, just like in Game One. This time he did give up a run, on a homer by Matt Holliday to tie the game in the fourth. But he only gave up four hits scattered throughout his 7 2/3 innings, and the Cards never had more than one baserunner an inning. He struck out seven, walked none. And there was no dramatics in the ninth inning this time, as Koji Uehara retired Matt Carpenter, Jon Jay and Matt Holliday quietly on 12 pitches. So now the World Series shifts back to Boston, for Game Six and — hopefully — Game Seven. Yet it’s hard to feel terribly hopeful at this stage, at least for me, about World Series championship 12 becoming a reality this season. Sure, there’s the lack of hitting — surprisingly, the Cards team batting average is actually better than the Sox, .218 to .205 (even with David Ortiz’s crazy .733 average). Plus facing John Lackey on Wednesday night in Game Six is certainly more encouraging, especially with Michael Wacha going for the Cardinals. Beyond that, though — and I would love to be proved wrong — is this feeling I get that the magical ride is coming to a close just short of the final destination. Boston just seems to have “it” — fate or FOX and all the national media plus everyone else but us and Yankees fans rooting for them or whatever — that makes me feel like, damn it, they’re going to win it. As I said, I would love to be proved wrong. And it starts with winning Wednesday. The Cardinals have the right guy starting, for sure — we all know just how incredible Michael Wacha has been, especially this October and especially when it’s all on the line. Can he do it once more — can be be the savior yet again? Can the Cardinals get enough offense to prevail and send it to Game Seven? We can hope so, on all accounts. Yet it’s a taller task than ever, returning to Boston and Fenway Park with that already crazy atmosphere and the promise of a Red Sox win meaning the celebration of a World Series championship at home for the first time since 1918. It’s not impossible. It could be improbable — but that’s why they play the games. And we know the Cardinals excel when the pressure is on. One final thing about October, and the magnification of everything — the wait between games can be interminable, the time ticks away so slowly, and it just crawls along that much more during these breaks in the World Series. Yet all we can do now is wait. This entry was posted in 2013 Season and tagged Adam Wainwright, Boston Red Sox, Matt Holliday, Michael Wacha, Postseason 2013, St. Louis Cardinals, World Series by Christine Coleman. Bookmark the permalink.